It was the fourth branch of government that defeated the bill proposing universal background checks for anyone purchasing a gun. They accomplished this even though 90% of citizens were in favor of such legislation. This fourth branch is in the shadows and it is not controlled by the voters. Instead, it is controlled by money coming from special interest groups such as the National Rifle Association, the President's "Organize For Action", the Koch brothers, Sheldon Adelson, Citizens United, all labor union PACS and approximately 4,600 other political action committees. In the case of PAC's, they in theory represent a group of voters who are supporting the PAC. This creates a problem that: 1). Not every voter belongs to a PAC and 2) Not all PAC's are created equal. The more money the PAC has, the more influence they have. Further, the more one contributes to a PAC, the more influence that person has over the PAC. Making things worse, these organizations have control over the other three branches of our, tongue in cheek, government. Most of these PAC'S are controlled by a small group of individuals making the decisions. In addition to these Political Action Committees, our elected officials spend much of their time soliciting money from very wealthy individuals in the following industries: Wall Street, Banking, Entertainment, Energy, Home Building, Technology and others. Politics is the only industry I am aware of that allows its employees to take a paid leave of absence from performing their duties to look for another job; their reelection. I am very pessimistic. 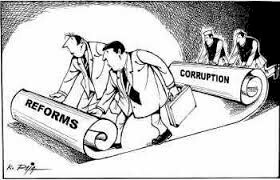 If we do not end this corruption the country will continue in its slow decline.